If you’ve read part 1 of this article, you will probably feel my frustrations or at least laughed out loud. I had tried several Internet providers and yet even when I settled on one that was adequate, my internal network was still shabby to say the least. This second part has been a long time coming so without further a do, let’s get on with how I went about upgrading my home network. The MiFi device that I was using as a router\3G modem is great for mobility but doesn’t have the power to give me the coverage I needed so I bought a TP-Link MR3420. This is effectively a wireless router with a USB port that supports a wide range of USB 3G modems. The one that I had been provided by 3 when I got the PAYG deal was on the compatibility list. The other good thing about this dongle is that is has a CRC9 connector for an external aerial to help boost signal strength. I didn’t have any power in the loft of my house, which is where I wanted to have the modem…the higher the better. Rather than just use a really long aerial lead, I got Mr Electrician to come around and fit some lighting, four power sockets and a couple of switches in a cupboard at the top of the stairs so that I could power cycle any kit up in the loft without climbing up there. It’s been handy, although I’ve only had to do it a couple of times since installation. 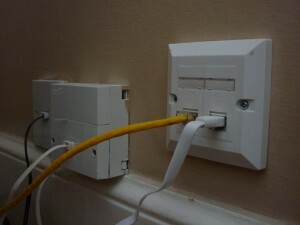 We also fed a couple of RJ45 leads from the loft down to where the telephone sockets are. Below are some pictures with descriptions. The picture above is looking upwards in to the top of the house. On the right is the TP-Link router. You can see the USB lead that goes off to the USB dongle at the bottom. Two of the Cat5e leads are connected to a patch panel in the loft and from there downstairs, the other connects to a Power Line device which isn’t functional at the moment but will, for those who are unaware, will allow me to run networking over the mains power. Finally, the device at the upper left is a 3G aerial. I’m toying with mounting it to the outside of my house for better gain. I’m also not too happy about the temporary feel of this picture e.g. having a 3G modem right next to a power lead. 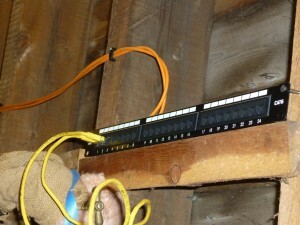 Here is the patch panel that connects the yellow leads from the router to the orange leads that get routed downstairs as you’ll see. The patch panel is Cat6. Yuck, no wonder it was lying around spare at work. I was pleased that the joists were just the right distance apart to let me screw the patch panel in. 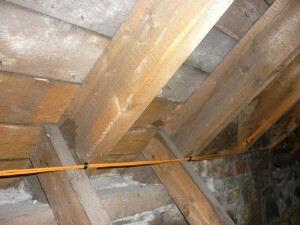 The data centre grade cables travel in between the joists downwards and come out in the space shown above. As is quite common in the part of Scotland I live in, many rural houses are built as 1.5 storey properties i.e. the upstairs rooms have a slant as they meet the roof. The space above is accessible through a small entrance in the master bedroom. It is quite spacious and gives great access to some of the plumbing and wiring. I used clips at every joist to make it look neat. The most difficult part was getting the leads from the previous picture down to the ground floor. A fair bit of poking around was required but above you can see the dual RJ45 wall port that are both connected back to the router. The yellow lead is run around the skirting board and through a small hole in the wall to my study, where my main PC is just on the other side. The white, flat lead, as some of you may recognise, goes in to my Sonos wireless bridge which is sat on a small table nearby. Yes, that was me that did the painting around that phone socket when we first moved in. As I stated before, I also have a Power Line device that I can plug in anywhere to connect to the other one in the loft but I’ve not had any need to use it so far. The wireless signal covers the entire house and I’ve not got any devices that don’t have wireless. Having said that, I do have a Raspberry Pi and I may just use the Ethernet port so I can use the WiFi adapter elsewhere. I’m not sure yet. So has the networking improved? Most definitely. The biggest improvement is the wireless internally. All devices can now talk to each other at different ends of the house. The 3G still isn’t great but it’s much more stable than it used to be. The packet loss is 0% most of the time but once a couple of devices start trying to download at the same time, the connection evaporates which isn’t great and shouldn’t be acceptable in this day and age. I think I need to apply some science to determining the root cause. There are tweaks I can make to try and improve further which I mentioned above e.g. mounting the aerial externally. If I make any further amendments, I’ll keep you posted. In part 1 of this article, I give a little background of how my home network has previously been set up. 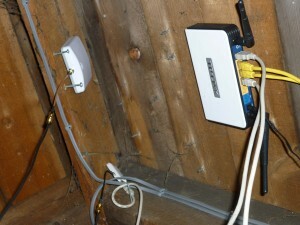 In part 2, I go through the plan of upgrading my home network and how that plan was implemented. I’ve lived in my current house for six years. It’s an old farmhouse out in the country and my wife and I fell in love with it as soon as we saw it. I had asked the previous owner if she could get ADSL and she reported she hadn’t signed up but was under the impression it was available. Upon moving in, I signed up with an ISP who thought it should be possible, but alas upon installation of the router and filters, it wasnt to be. I had British Telecom engineers out to my house, their Higher Level Complaints team on the phone frequently but it just boiled down to me being too far from the exchange. This was rubbed in further by houses on each side only a 1/2 mile away that enjoyed ADSL Internet access. BT’s line routing policy meant I was stuck. So I used dial up for about a year and nearly went insane due to having to take this step back to the (1st world) dark ages. Migrating 750 MS Exchange users to a new domain via Powershell over a high latency\low bandwidth dial up VPN connection is about as much fun as sticking pins in my eyes. On top of the weekend overtime I was putting in, I was also on the on-call rota for one week in six. More often than not, I’d find myself driving around to my parents who live a couple of miles away to use their broadband if I thought the job would take more than 15 minutes. RDP over dial up is appalling more often than not. When you need to RDP on to your jump box via VPN to then RDP on the customer’s jump box to then RDP on to the server in question (I love customer’s requirements), a five minute job could literally take well over an hour. I then heard about the Scottish Government stumping up a paltry £3.5M to fund it’s Broadband Outreach programme, to bring broadband to those that were currently unable to receive it for whatever reason. Enter me and about 10 neighbours of mine. I jumped at the chance to be our ‘cluster’s’ front man and was soon dismayed to find out that the final solution would be two way satellite, provided by Avanti who at the time didn’t have a great reputation. The fact that I spent every day under contract with them wishing I had an alternative should clarify if that reputation was founded or not. Quite frankly, they were appalling. 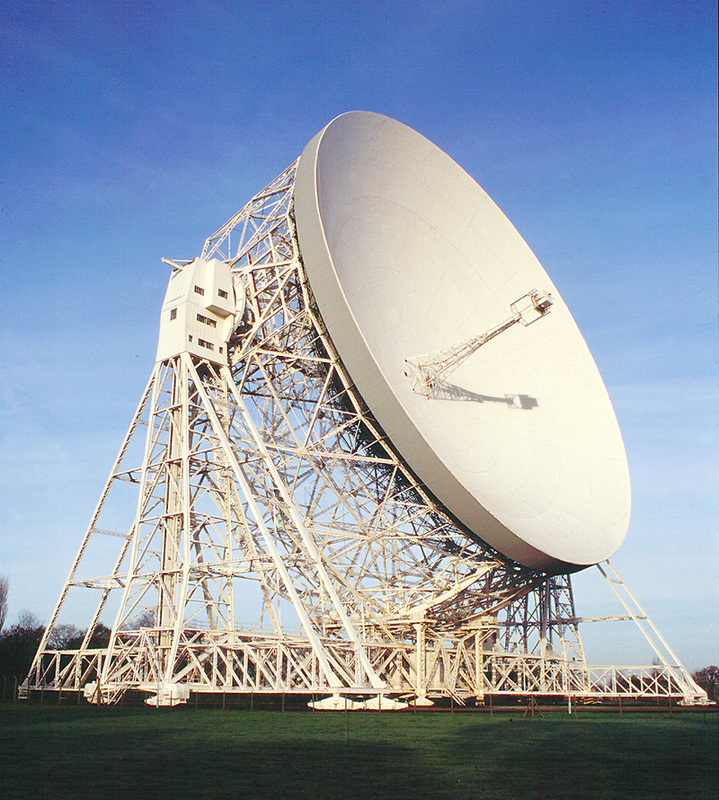 The dish was almost the size of Jodrell Bank. The modem was the size of a DVD player and it had two thick strands of coaxial cable running to it via a hole in the wall. On a good day, the latency was 750ms. On a bad day, it simply didn’t work. It cost about £45 a month for a 2Mb\s connection which thankfully, my company stumped up the lion’s share. Something had to be done. I had tried a number of different 3G mobile dongles from T-Mobile, Orange and Vodafone and all were worse than the satellite. Even walking around the house outside with my laptop made little difference. My house has 12-18″ thick walls in places so I was still willing to have something mounted outside with a lead coming back in. After about 3 years of putting up with the satellite, I decided to look at the problem again, this time reviewing 3’s website, another mobile provider who were one of the first to market with 3G in the UK. I checked their site which claimed I could get 3G at my postcode. I decided to give their PAYG package a ‘low risk’ try out. When I got the dongle home to test, I got the same lame connection. But when I walked around the house with this one, I would find some sweet spots where the latency dropped to 70ms and I could get a solid 1Mb\s up and down speed! This was massive progress, despite some of my colleagues from the big smoke advising me their home connection had just been upgraded to 100Mb\s. I did a good selection of testing, including my work VPN, YouTube, general browsing and a long lost art for me…online gaming using Call of Duty: Modern Warfare. All passed with flying colours and I signed up for a contract. It is worth pointing out at this stage that my internal network was crappy too. Those hefty walls are great at stopping WiFi as much as 3G signals. When I got the MiFi device (a 3G modem and WiFi AP\router in one device), it was best placed in the main bedroom, plugged in for a stronger, more consistent signal and draped over the latch on the window. Unfortunately, the TV room is downstairs and at the other side of the house i.e. pretty much as far from the MiFi as possible. I bought a WiFi extender but it simply repeated the signal on the same channel and so, whilst it made the coverage better, it didn’t seem to improve connectivity if there were a couple of devices trying to connect at the same time. Access to the MiFi was affected with packet loss due to collisions\retransmissions. I needed a more resilient solution so I took a more holistic approach to my networking needs. In part 2 of this article, I outline the design I came up with and give some installation pictures. Hopefully, some people reading this might find some nuggets of inspiration. At the very least, I hope it puts a smug smile on some of the 100Mb\s+ brigade! Need to go now, the electrician has just turned up to power up the loft.